READING, PA—Reading Area Community College announced today the retirement of long-serving Board of Trustees member Connie Archey, effective July 1, 2017. A strong proponent of the College since its inception in 1971, Ms. Archey joined the RACC Board of Trustees in 1981. In those 36 years, she has attended every RACC commencement, and worked tirelessly to support the school’s growth as an institution and as a strong educational partner to the communities of Berks County. Recently honored by the RACC trustees as a James H. Yocum Trustee Emerita for her outstanding service to the college, Connie served terms as the board’s chair, vice chair and secretary during her service. She was also the long-time finance committee chair, served on numerous committees, and is a longtime contributor and supporter of the Foundation for RACC. One particular committee Archey served on was the search committee which selected current RACC President Dr. Anna Weitz. 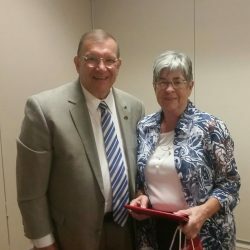 “Connie Archey’s 36 year commitment to service at RACC serves as a shining example of the best a community college Trustee can be. Her frequent and consistent interaction with students, faculty and staff in multiple settings on campus that demonstrated her willingness to learn firsthand about our College and how she as a Trustee could ensure that student success was RACC’s first priority. Our College thanks her for her outstanding service knowing she will continue to be an advocate and supporter,” says Weitz. The Berks County Commissioners are currently seeking a replacement for Ms. Archey’s seat on the Board.